One LPL advisor in New York is using Riskalyze to determine which “separately managed account” product is the right fit for his clients and prospects. He uses the Cougar Global Investments SMAs on the LPL Model Wealth Portfolio platform. There are four SMA products: Cougar 6, Cougar 8, Cougar 10 and Cougar 12. 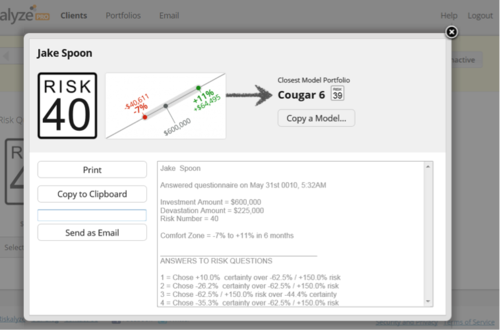 The advisor added each of the Cougar SMAs in as individual model portfolios, using the methodology on the Riskalyze Knowledge Base for adding SMAs using the Custom Investment button. He allocated 100% of each model portfolio to that respective SMA. Two things stuck out at the advisor. First, by looking at the real risk behind the four different Cougar funds, it turned out that Cougar 12 has slightly less risk than Cougar 10. That was a surprise to the advisor, who expected that the funds had a “stair step” of risk tolerance with their higher numbers. Investment objectives do not always equal true risk. Second, it became much easier for the advisor to figure out which Cougar fund was closest to his clients. After capturing their Risk Number, Riskalyze points the advisor to the closest model. Whether SMAs simply overweight and underweight sectors, or use a purely tactical strategy to try and achieve returns in any market, Riskalyze provides a simple way to quantify their risk and match clients to the product that most closely fits their risk tolerance.